Recep Tayyip Erdogan has been clamping down methodically on the media in Turkey for years, first as prime minister and now as president. The persecution of journalists across the political spectrum is growing in ferocity and includes arrests, threats and intimidation – all actions unworthy of a democracy. His victims include Can Dündar, the editor-in-chief of the Turkish daily Cumhuriyet, and Dündar’s Ankara bureau chief, Erdem Gül, who were jailed on the evening of 26 November for publishing evidence in May 2015 of arms deliveries by the Turkish intelligence services to Islamist groups in Syria. Both are exemplars of journalism, the search for truth and the defence of freedoms. Cumhuriyet was awarded the Reporters Without Borders (RSF) Press Freedom Prize in the media category in 2015. “Dündar will pay for this” President Erdogan said in a public statement, referring to the story on arms deliveries. But Cumhuriyet’s journalists just did their job, publishing information in the public interest. At a time when jihadism is at the centre of everyone’s concerns, it is unacceptable that political prosecutions are used to suppress investigative reporting. 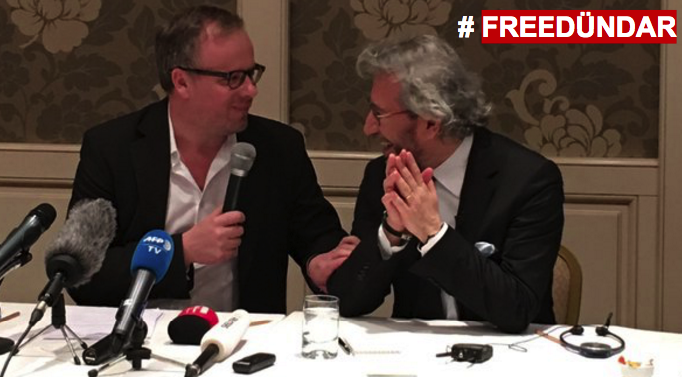 As a result of an energetic campaign both in Turkey and internationally, Dündar and Gül were freed on 25 February, after the Constitutional Court ruled that their provisional detention violated their fundamental rights. The campaign has borne fruit but it cannot stop here. They are still facing possible life sentences (with no provision for a pardon) on charges of spying and complicity in terrorism. The trial will begin on 25 March. RSF will be there, at the side of these two information heroes. Together, public figures, citizens, media freedom NGOs and unions, let us send a strong message to President Erdogan. Let us call on him to drop all charges against Dündar and Gül. Let us call on institutions and governments to accept their duty to respond to the Erdogan regime’s increasingly authoritarian excesses. Let us urge the Turkish authorities to free all journalists who are detained in connection with their reporting or the opinions they have expressed, and let us take a stand against the flagrant degradation of media freedom in Turkey. Together, we can save independent journalism in Turkey!